BeFirst publishes to multiple social channels for clients. The publishing module makes publishing very easy and effective. Workflow allows our team to handle customer service requests and brand management issues very quickly to maintain a company's reputation. The ease of set up in the listening module, makes brand reputation very effective. The platform does offer platform provide sentiment analysis, and it works great. The team has found that is very easy to keep up conversations and answer customer for clients or forward the infomation to said client. Need to better the UI. Saving cookies, and facility to save default landing page would help. System needs to auto-set for personas. Good customer service and skilled account manager keep me going with Simplify360. I think AgoraPulse combines the best aspects of Sprout Social and Hootsuite into one program. 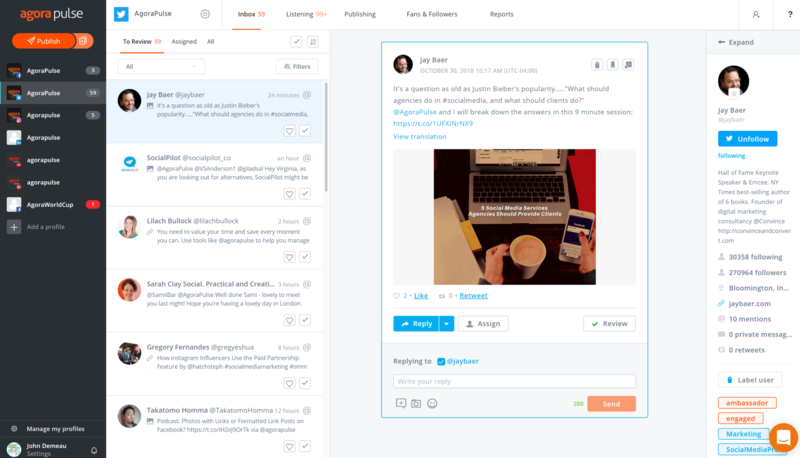 Hootsuite is fantastic for listening, but lacks in the publishing and metrics departments. Hootsuite also does not have any form of Instagram analytics. Sprout Social has great tools for metrics but I feel like their listening tools are lacking. I feel that AgoraPulse has all of these tools and is the perfect platform for listening, publishing and metrics. Huge time savings on building weekly and monthly campaign performance reports.